The case which is related in part in these following pages is one of the most complicated and the best observed of all the cases of which French investigators have had knowledge over the course of the past 21 years. My analysis will however deal only with its presumed physical aspect — which is probably the least important. Indeed certain other aspects, more difficult to tackle, are still developing, and must be related later — at any rate if the investigators now working on them secure significant results. I shall likewise omit the historical and geographical context: it is striking to observe that objects similar to the one described by “Dr X” were seen in Spain on the same day and on the previous evening, and then again on December 7 in Morocco and on December 9 in Peru. Striking too is the fact that all these incidents should have occurred at the same time of the night. These similarities will not be examined in the present article. 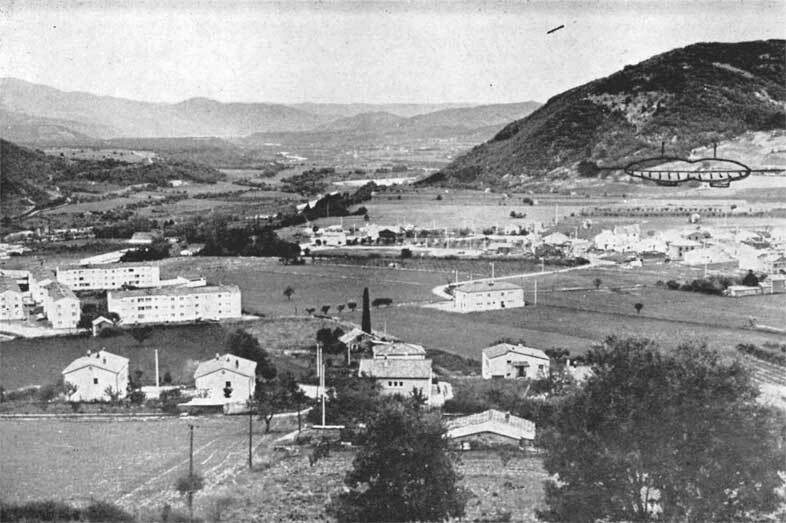 (a) Dr X holds an important official position in a town in the South-East of France and insists for this reason on remaining anonymous. He was born in 1930. University education (doctorate) and highly qualified in one of the fields of biology. A very talented musician (we shall see that this is not without importance). No knowledge of mathematics. I have known Dr X for a long time, having become a friend of his in a club where several childhood friends of mine are members. He is a sensitive person, discreet, very active intellectually, of the introverted type. Eyesight 10/10 in both eyes. During the war in Algeria, he was blown up by a mine on May 13, 1958. In a coma for 24 hours: X-ray diagnosis: sub-dural haematoma of left occipital region, possibly with occipital fracture. 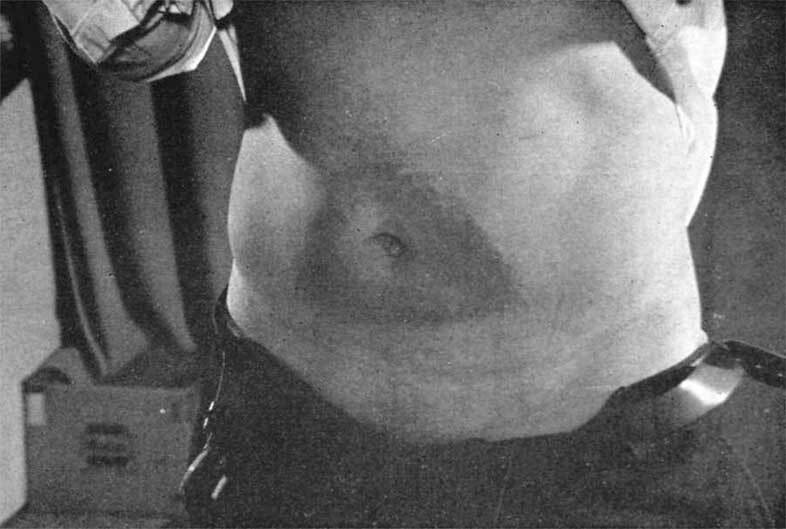 Right hemiparesis (whole of right side) with paraesthesis, marked change in muscular tone, and intermittent crises of thorax-curvature type. Is sent from hospital to hospital until October 1958. During this time he loses 20 kilos (from 70 kilos). After leaving the hospital, he slowly recovers his normal weight, but still has his right hemiparesis and a high degree of fatigability of the right side (arm and leg), upright standing position painful to him, and it is impossible for him to keep his balance on the right foot only. Likewise, tone of right hand altered, causing him, to his deep regret, almost to give up playing the piano. Married, father of a baby born on June 27, 1967. On October 29, 1968, at about 2.00 p.m., Dr X was trying to chop, with an axe, a stump of boxwood on his property, when an unfortunate slip by him caused the stump to strike the front edge of the left tibia, at a point 13 cms above the inner ankle: superficial wound, but with a broken vein, leading immediately to the formation of a large haematoma, with swelling deforming the trouser-leg, intense pain, and he faints. It is important to follow the development of this injury up to the night of the incident. Treated immediately with counter-inflammatories, antibiotics and analgesics, the swelling goes down or, to be more precise, it moves downwards towards the foot. Medically prescribed rest for four days with leg extended. Wednesday, October 30, 1968: foot swollen, heaviness, tingling sensations, general fatigue. Thursday, October 31: foot “like lead”. Impossible to stand upright, shooting pains in foot, tingling sensations. Friday, November 1: swelling going down, but same pain still. Cramps in calf. Night of November 1/November 2 until 3.55 a.m.: No change. (b) The child. Is the second witness, and interesting, in view of his age, 14 months at the time of the incident. Curiously precocious baby. Walked at 9 months and one week. First teeth at 3½ months instead of 6 months. In advance of normal by six teeth. Overwhelming vitality, sleeps little, wakes up often and asks to be fed. (a) During the second part of the night of November 1-2, Dr X, sleeping in room 1, is awakened by his son’s calls (calls, not crying), in which he recognises the onomatopoeic sounds by which the baby designates everything shining — a sort of rho! rho! which I myself heard a few days later when the baby indicated to me the fire in the hearth. Hearing his wife still sleeping, the doctor arises painfully without turning on the light, and crosses the corridor from room 1 to room 2. At the same time he becomes aware, though without paying attention to it, that a storm is about to break. He finds his son standing up in his cot and saying rho! rho! and pointing very excitedly towards the window. The shutters are of the solid kind and closed, but the chinks at the top and sides permit the doctor to see the intermittent light of what he at first takes to be flashes of lightning. Later, he recalls that the flashes were far more frequent than the thunderclaps, and were periodic, but at the time he pays no attention to this, his mind being occupied with the pain in his leg and with his desire to calm the child down as soon as possible so as to be able to get back to bed. While he is switching on the light, he thinks that there is a mighty wind blowing above the house, while the rain whips against the walls, the tiles, and the shutters. (b) He picks up the empty feeding-bottle from the baby’s cot and goes into the bathroom (see sketch plan, figure 1, room 3) puts 40 grammes of water into it and comes back into room 2, gives it to the child to drink (the child at once becomes quiet), then he turns off the light, goes out, and shuts the door again, saying to himself that he had perhaps better go and see which is the badly-closed shutter that is being rattled by the wind. He decides to go to it, turns on the light, and crosses the corridor to the living room (4), where all the sounds in the house can be heard; he turns on the light there, listens up the chimney-shaft, wondering if it is not a loose tile, and he finds that the noise is coming from the upper storey, over the kitchen (5). From the living-room a stairway leads up to a gallery which ends at room 6 above the kitchen. The doctor slowly climbs the stairs, reaches room 6 and for the first time sees the landscape outside, for here, although the window is closed, the shutters are open and lying flat against the facade of the house. He now discovers that the piece of open country overlooked by his house is lit up at regular intervals — with a periodicity of roughly about one second — by powerful flashes which illuminate the valley and the mountains beyond the river for a distance of 3 or 4 kilometres. The colour and the intensity of the light are like those of the full moon. At the same time, he realises that it is not lightning, for there is no longer any thunder at all. But the source of the light remains invisible. These flashes give him the impression of not being instantaneous, but of lasting a fraction of a second. In between the flashes, the darkness is total. The rain is still pouring down. The doctor opens the window, and leans out to get hold of the shutters, and at the same time he tries to pinpoint the source of the light. The source is not to be seen, but the shadows cast indicate that the light is behind the house (i.e. towards the west), not very high, nor very low. The doctor closes the shutters and goes down into the living-room (4) again, still suffering with his very painful leg, and from there he goes into the kitchen (5). His attention and his curiosity are at this moment still only quite faintly aroused. He would like to know what those lights mean, but above all he wants to go back to bed and get to sleep again. However, he goes into the kitchen, the window (7) of which, having no shutters, looks out to the S.S.E., in the direction of the valley, and, so he thinks to himself, will perhaps enable him to see the light source which he could not see from room 6. As he enters the kitchen, his glance falls first on the electric clock, which shows 3.55 a.m. (till this point he had not known what time it was). A movement which he now makes shows how slight his curiosity still is: before walking over to the window, he opens the refrigerator, pours himself half a glass of cold water, and drinks it. The scene that presents itself from the window (7) shows that the source of the light is still further to the right, for the corner (8) of the house is still hiding it. This light source must be quite local and not very far distant towards the West, for although the surrounding countryside is brightly lit up by the flashes for up to a distance of as much as several kilometres, the distant landscape, 10 kilometres off, remains in shadow. It is true that at this moment the rain is still beating down strongly. So he returns to the living-room (4), still limping painfully. There, two double french-windows (9) and (10) open out towards the S.S.E. on to the terrace. Both these french-windows are closed, as are also their solid wooden shutters. The doctor approaches the french-window (10) and throws both sections wide open. It is important to note that all these movements, from the moment when Dr X left his son’s room, have been performed in bright light. When he opens the double door onto the terrace, the latter is consequently visible from outside as a large illuminated rectangle. Let us now pinpoint the precise position of the house since — for understandable reasons — the map of the district cannot be published. 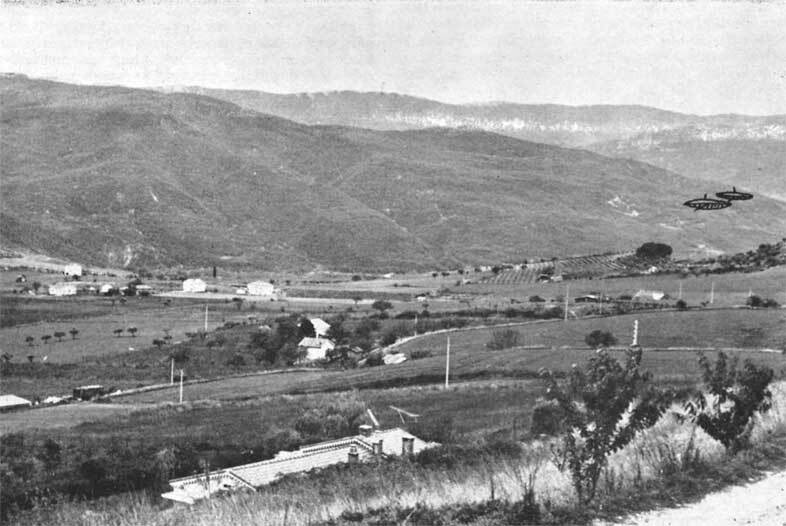 Dr X lives on the side of a quite steep hill which, towards the south, from a height of several tens of metres, dominates a small plain several square kilometres in extent where, among the old farms scattered here and there, the buildings of the fast expanding nearby town are beginning to spring up. 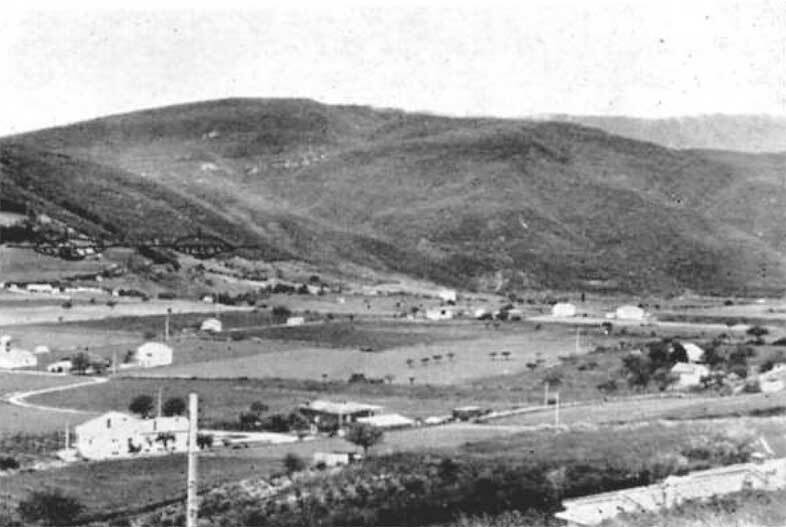 To the north the plain is dominated by the small ridge on which the doctor’s place stands, and to the south it is dominated by the outlines of more complex hills rising higher and higher in several stages towards the S.S.W. To the West, the ridge on which the house stands widens out into foothills that descend towards the river and so delimit the plain on that side. The photographs enable one to grasp this situation. The photographs will also enable one to understand the order in which the following occurrences took place. The photos were taken six days later from the exact spot where Dr X was at 3.55 a.m. during that night of November 1-2, 1968. We will follow the precise order in which the events occurred. So, Dr X opens the double french-windows. The rain, which had still been pouring down when he was in the kitchen, has now stopped except for a few drops. The doctor is wearing pyjamas. Under the pyjama-top a singlet. The pyjama-top and the singlet reach to below his navel. He is bare-headed. He at once looks to the right, and beholds there the scene shown in photo No. 1: two identical luminous objects, the one on the right seeming to be a little smaller and slightly above and behind the other one. 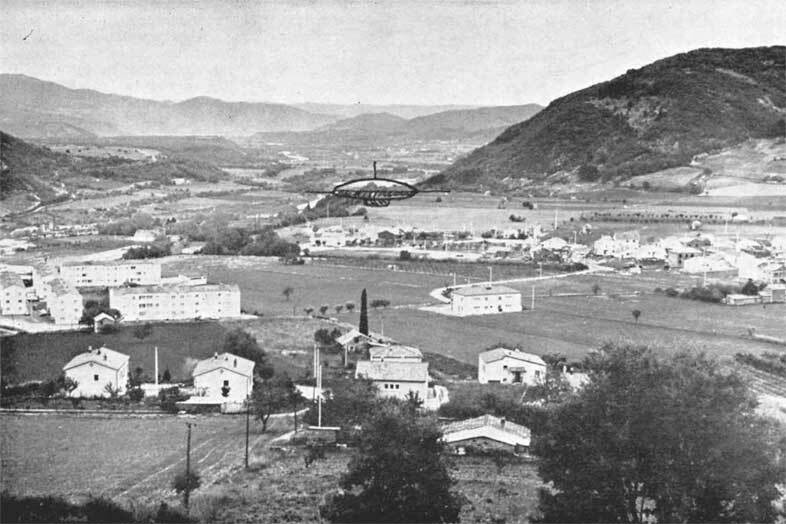 (a) Description of the Objects in the Position Shown in Photograph No. 1. They give the witness the impression of being either two cigars or two circular objects seen in profile (at this stage he is unable to decide between these two hypotheses). Each object consists of two superimposed parts that are markedly symmetrical throughout their horizontal extent, the upper portion appearing perhaps to be thicker. Colour of the upper part: a luminous silvery white, but much less so than the full Moon. Colour of the underpart: a deep sunset red, brighter at the top than at the bottom. No structure can be distinguished in either the white or the red portion. No variations either. At the moment corresponding to photograph No. 1, the witness can distinguish four of them (two on each object). To begin with, there are two vertical antennae of the same colour and the same luminosity as the upper parts of the objects. Length apparently equal to the thickness of the object. The bases of these two antennae are thickened. The two other antennae, of the same colour and brightness, and apparently of the same length, are more slender and do not appear to be thickened out at the base. They are seen as a silhouette in the red portion of each object and extend beyond it slightly. Their bases are at the junction point where the red and the white parts meet. They are parallel and pointing slightly towards the left of the witness. At this moment only one horizontal “antenna” is visible on each object, any other possible “antennae” being hidden by the objects. (c) The Beam of Light. The lower centre part of each object is emitting a vertical cylindrical white shaft of light — brighter throughout its whole extent than the witness could have expected from a simple beam of light — which, as it passes through it, illuminates the thin storm mist hanging in the valley. The source of the two beams of light is not discernible. The foot of each beam plunges down behind the brow of the hill, beyond the little saddle lying to the right of the clump of trees. Neither of the tips of the light beams is therefore visible. The two objects display in unison a cyclic luminous activity of a periodicity which is perceived to be about equal to one second. It begins with white flashes that give the witness the impression that they are “entering” through the external antennae, that is to say, via the two vertical antennae, the visible horizontal antennae of the left-hand object, and an invisible point situated behind the right-hand object, slightly to the left of, and below, the base of the vertical antenna. These “flashes”, although brief, are not instantaneous. The flashes, external as well as intermediary, are white, not dazzling, and are silent. The form they take is a slight prolongation of the antennae in a straight line, without any spreading, and with a slight trembling movement. Their intensity is the same as the intensity of the vertical beams of light. 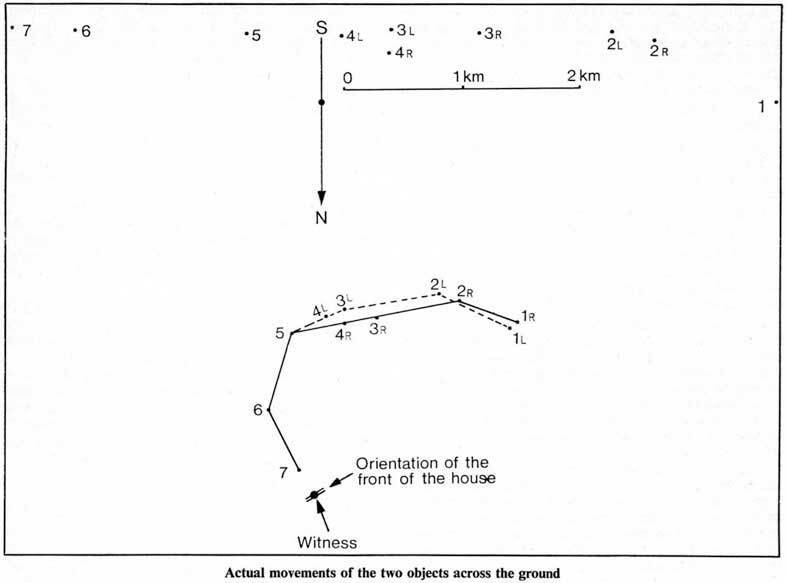 At the start of the sighting, the two objects are moving as one unit towards the left, at the same time approaching slightly nearer to the witness. We shall see further on that the investigation of this case has enabled us to establish precisely their actual speed and trajectory. The two objects continue their movement in the same direction and at the same apparent speed. Their position in relation to each other undergoes a modification: the right-hand object emerges more and more from behind its companion. This movement, which is at first perhaps only an alteration in perspective, combined with the displacement towards the left, permits a second horizontal antenna, identical with the first, to appear on each object: Then the two objects perform a rotation on their axes, the two horizontal antennae projecting on either side of each object. The witness now discovers that the external horizontal antennae are performing, in their luminous activity, the same role of “absorption” as the inner antennae, exchanging the second flash of each cycle without it being possible to see any direction of propagation, and that the four horizontal antennae seem to lie on one single straight line, which appears to be parallel to the trajectory of the two objects. We have seen that, at position 1, the spotlights at the tips of the light-beams were invisible. Suddenly, slightly before position 2, the spotlight of the left-hand beam begins to appear to right of the little white dot visible on the profile of the hill, but further off. At this moment the two objects perform a manoeuvre which eventually causes them to appear — as seen by the witness — to be side by side, of identical size, and presenting their horizontal antennae symmetrically. At the same time, the sources of the light-beams become visible on the under-surfaces of the objects: it is a sort of protuberance of the same red colour as the under-surface, but of a darker shade. The under-surfaces of the objects still reveal no structure. The flashes continue to shoot out in the same way and in the same rhythm. The objects continue to move towards the left in the same relative position to each other, but their apparent size increases very perceptibly. The spotlight of the left-hand beam has become very clearly visible, and the witness clearly follows its passage across the countryside, each flash fixing, as it were, a snapshot in his memory. When the two objects arrive at a position slightly before the position of photo No. 3, the spotlights of the two light-beams become visible simultaneously. At this moment the two objects commence a new manoeuvre which consists in drawing near to each other. Whereas previously their relative distance from each other increased angularly like their angular dimension, the two spotlights, having become visible, begin to draw near to each other. This drawing nearer to each other is effected without cessation of either the movement towards the left or the angular enlargement or the luminous activity. Although the objects have increased considerably in size, Dr X still perceives no structures. From position (2) onwards they are at the same height as he is. At (1) they seemed lower. The left-hand movement continues at the same time as the increase in the size of the objects and their closer approach to each other. Following with his eye the spotlights of the beams on the countryside, Dr X realises that the increase in size does in fact correspond to an approach in his direction, for they seem to be performing a great sweep towards their left. The flashes continue to shoot out, although the intermediary flash gets shorter and shorter. In the position shown on photo No. 4, the inner antennae are about to touch. At this moment the witness observes that the spotlights of the beams are approaching each other, then they interpenetrate each other, and from here on they form only one spotlight. For a brief instant afterwards, or perhaps at the same time, the inner antennae touch, and at once all the luminous activity ceases on all the antennae, which however remain luminous: darkness falls once more over the countryside. Meanwhile the two objects continue to draw closer to each other. The inner antennae interpenetrate each other and then disappear entirely when the two objects come into contact. This contact is transformed, without discontinuity, into a progressive interpenetration or unification, while the leftward movement still continues and the spotlight shifts more and more towards the left, cutting obliquely towards the left from the trajectory and approaching the witness, and the object grows bigger (after No. 5) above the plain. There is now only one object, absolutely identical with the two antecedent objects except for one detail… at the precise moment of their complete unification, Dr X sees for the first time “something that is moving” in the red (lower) portion of the object. 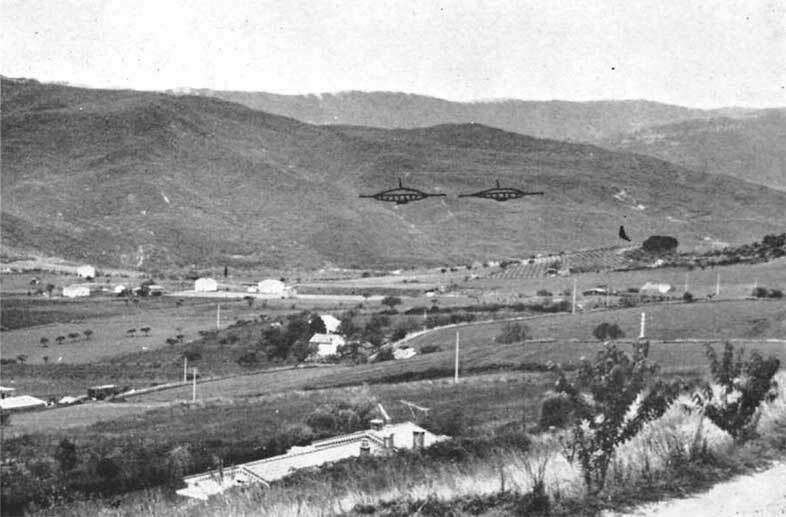 At the same time, the leftward movement stops, and the object begins to come straight towards the witness, growing rapidly in size, while the light-beam cuts a straight path across the plain towards the house, and the moving structures of the red portion appear more and more clearly visible. The object grows in size until it is enormous. The object and the light-beam halt. The stationary beam illuminates a circular area bounded on the left by the ridge of the roof of the second house starting from the left, and bounded on the right by the edge of the roof of the next house. The sketch of the object has been made by the witness who however thinks that he has placed it too far to the left and much too low down (let us not forget that after photograph No. 4 the landscape had vanished in the darkness). Around the light-beam, its light and the light from the object dimly light up the houses and the trees. Dr X is able to see that the object extends across towards the left from the beam to the vicinity of the roof-top of the house on the left, and, to the right of the light-beam, to a bit below the house with the three small windows. When it halts, the lateral antennae are seen as precise prolongations of the juncture-points of the two portions, upper and lower, “like a chicken on a spit”. However, the witness has the impression that, right in front of him, the red (lower) portion is protuberant. The white upper part presents nothing singular as regards either colour or brightness. The upper antenna is merely an extension upwards. The device from which the cylindrical light-beam shone out had the appearance of a ringed corona, on which Dr X is able to count, bounded by black lines, six sections on the side that is visible. These sections appear with the distortion due to perspective, wide in the centre and narrowing towards the edges. But it is the red (lower) part that presented the most impressive features. This part was also divided into “sections” but, it seems, in violation of the laws of perspective. Of the eleven visible sections five (the paired sections) were traversed from top to bottom in about four seconds by a dark horizontal line “like the lines that move across a TV screen when you are adjusting it”. The moving line descending cyclically appeared like a maximum deepening of the colour, with shading-off on each side. The witness was unable to detect any coordination between the respective movements of the five lines. It merely seemed to him that when one line was disappearing towards the bottom another one was appearing above. All the red portion of the object gave the impression of incandescent metal or of internal lighting. Although all this animation of the red portion seems to have occurred in violation of the laws of perspective, the vertical bands were wider towards the centre, right opposite the witness. The activity in the red portion lasts for a period that the witness is unable to estimate subjectively, for he is obsessed with the movements of the horizontal lines (we shall see, further on, his replies to the questions I put to him afterwards). Meanwhile, after a period of time which seems long to him and during which the object remains totally immobile, he sees the spotlight move towards him, slowly at first, over a distance of a few metres, lighting up one by one the telephone poles and reaching the top pole. This movement of the spotlight was the result, not of the object’s having come nearer, but of a rotation around the axis formed by the two horizontal antennae, which rotation dipped the upper part of the object towards the valley and revealed progressively more and more of the under-surface. Suddenly the rotation speeded up in an astonishing fashion, and the doctor received the light-beam, which shone all over him as well as probably over the whole front of the house. The total duration of the rotation was brief — of the order of a second. Meanwhile, the witness had sufficient time to observe the lower surface of the object, which appeared to be circular and divided into radial sections. He does not remember whether the movement of the lines was still visible in the sections. He had the impression that the corona from which the beam of light emerged was growing wider towards the periphery as the object tipped. During the tipping, the witness was frightened, and at the moment when the light-beam reached him he instinctively covered his face by a reflex action. At the moment when the object was presenting its under-surface vertically there was heard the first sound during the whole of the sighting, namely a sort of “bang” while, according to the witness, “the object dematerialised”, leaving behind nothing but its cloudy, whitish, fleecy shape which at once disintegrated and was borne away eastwards by the wind. At the same time (that is to say, at the same time as the “bang” and the apparent dematerialisation) there came, from the centre of the space occupied up till then by the object, a sort of very luminous, fine, white, straight thread, which shot out vertically in a fraction of a second towards the sky and vanished there, forming, apparently at a height of several hundred metres, a small white shining dot which itself then vanished with the noise of a firework. And, in fact, Dr X, who is walking to and fro, talking excitedly, no longer limps, and has completely forgotten his injury. Dumbfounded, he turns up the pyjama trouser-leg: the wound is healed and the swelling has disappeared along with the pain. And they do not return. On the occasion of our first visit, five days later, we, like Thomas, are able to place our hand upon the healed wound and feel the periostose, scarred or cicatrised (cal de l‘os); all of it is as insensitive as an ancient wound, whereas the medical certificates testify to the presence of the swelling and the wound right up to the time just before the incident. Dr X and his wife discuss the incident for half an hour and then go back to bed. Ten minutes after he has fallen asleep again, Dr X starts talking in his sleep — something that has never happened to him in his life before. Disturbed, his wife listens for a while and then, finding that what he is saying relates to the phenomenon seen by him, she turns on the light and takes notes. Inter alia, she notes down this statement: “Contact will be re-established by falling down the stairs on November 2nd.” At about 7.0 a.m. the doctor stops talking. Mme X turns out the light and goes to sleep. She awakens again at about 10.00 a.m. and, seeing that her husband is still sleeping, she gets up without waking him. He sleeps on until 2 o’clock in the afternoon. When at last he emerges from his slumber, Mme X asks him if he feels all right. “Very well”, he replies. “You should write to Michel and ask him to come and see you”, she says. The doctor’s reply is such that his wife realises that it is not Aimé Michel of whom he is thinking, but another man named Michel. Puzzled, she explains that he ought to tell Aimé Michel about what he has seen. But he does not know what she is talking about. He remembers nothing. Then his wife shows him his notes and the sketches done by his own hand. He looks at them with alarm, wondering how it can be that he cannot remember something so extraordinary. His wife does not insist further, for she too is alarmed, and she does not tell him about what he has said during his sleep. In the course of the afternoon, Dr X has an inexplicable fall, on the living-room stairs. “I had the impression of a hook in my leg”, he said later. He receives a knock on the head from it, and straightaway the full memory of the happenings during the night returns to him. In the days that follow, the doctor has an impression — in which he does not yet want to believe — that all the sequelae of his Algerian War wound — which had remained unchanged for ten years —have completely vanished. The nervous shock and the distress following upon the events of November 2 are however so painful that he feels ill and cannot be sure of their disappearance, which however seems to be a fact. When I visit him on November 8, I find he has lost weight and his features are drawn. That same day, cramps and pains appear in the umbilical region. They persist, more or less acute, throughout the following week. On the evening of November 17, he begins to feel an itching and pricking here and there around the navel, and a red cutaneous pigmentation, of striated appearance, develops. By mid-day on November 18, this pigmentation has assumed its final form, namely the shape of a perfectly geometrical isosceles triangle with a well-defined perimeter, measuring 17 cms. on the base and 14-15 cms. along the sides. At the same time the pains, itching and pricking cease suddenly and entirely. More and more worried about this preposterous phenomenon, the doctor and his wife telephone me. This triangle certainly has no known precedent in the annals of Ufology, but I think of the cases of irradiation reported on several occasions, and I advise him to have a thorough medical examination. This is done, that same day, and at the same time the photographs illustrating this article are taken. The medical examination is negative: the dermatologist can find no explanation for the phenomenon, which he considers so astonishing that he wants to make a communication about it to the Academy of Medicine. Dr X, little inclined to such publicity, manages to dissuade him from doing this. Dr X informs me by telephone of the results of the medical consultation. I do my best to reassure him, and I try my luck at proposing a psychosomatic explanation to him. He had in fact had quite a strange dream during the night of November 13-14, in which a triangular figure played a certain role in association with the object of November 2. I say to him: “No doubt it is your own anxiety that has taken this form and has impressed itself upon that part of your body where, for some reason or other, you have felt certain pains these last few days. 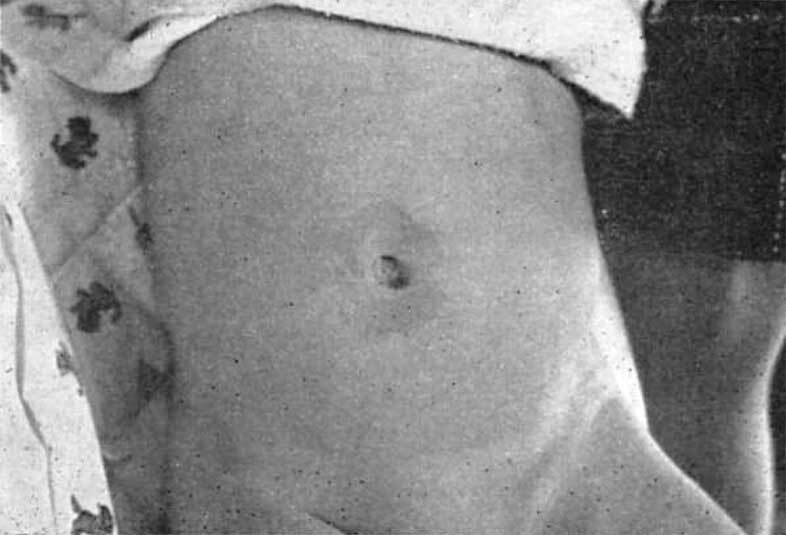 These pseudo-stigmata do sometimes occur, and have been studied”. With relief he accepts this explanation in which I, who can be helpful to him in his present state of nervous fatigue and uncertainty, do not, in my heart, believe in the slightest. …and son. Psychosomatic, or not? Let us break off the account of the case at this point, though it is not the end of it. I have said enough for the reader to realise that the divulgation of the full story is unfortunately impossible at present in view of the identity of the witness and the personal nature of the phenomena observed. Had I not been a friend of Dr X this case would never have been made known. And even though I am his friend, the case can only be divulged in part. His impression from the point represented by photograph No. 1 to photograph No. 7 were, successively, first astonishment, then perplexity, and then, at the moment when the object approached him directly, fear. He said: “I had the feeling that, if it did not stop, the object would, at the very least, knock the roof off the house.” However, his self-control at that point was still complete. It was a different state of affairs after the object took up its stationary position. Not only was its gigantic size impressive, but the play of the moving lines in the red portion had a sort of fascination for him. Several times he wanted to shout and call his wife, and to run and get his ciné and photographic cameras, which were loaded. But he did not do it. He did not dare to call out, nor to break off his observation of the object even for an instant, for fear lest something might happen in his absence, and also perhaps because of other reasons that he is not able to explain to himself. We were able to satisfy ourselves that Dr X had a precise and detailed recollection of the course of the events, and notably of their sequence in time and their apparent duration. Thus we took down a preliminary account, which I then got him to repeat on two occasions later, in a different fashion, with a two-month interval between them. Since November 8, 1968, we have remained in frequent communication with each other, and I have followed the development of the further phenomena that have occurred during the succeeding months — phenomena of a physiological, psychological, and psychic nature. In March 1969, having already completed a pretty full dossier on the case, I gave a talk about it before a group of astronomers from the Meudon Observatory, who gave me a number of useful suggestions. I also consulted professional psychologists and biologists in Paris. One of the most eminent of French specialists in hypnosis came from Bordeaux to spend two days with me in Dr X’s town, and got Dr X to talk three times under deep hypnosis, with pins deeply embedded in the tips of his fingers. These latter experiments are not yet concluded. All statements have been tape-recorded. Finally, having taken the most enlightened advice, and having respect for Dr X’s desire to remain anonymous, I decided to publish, in France and England, only the physical part of my investigation. 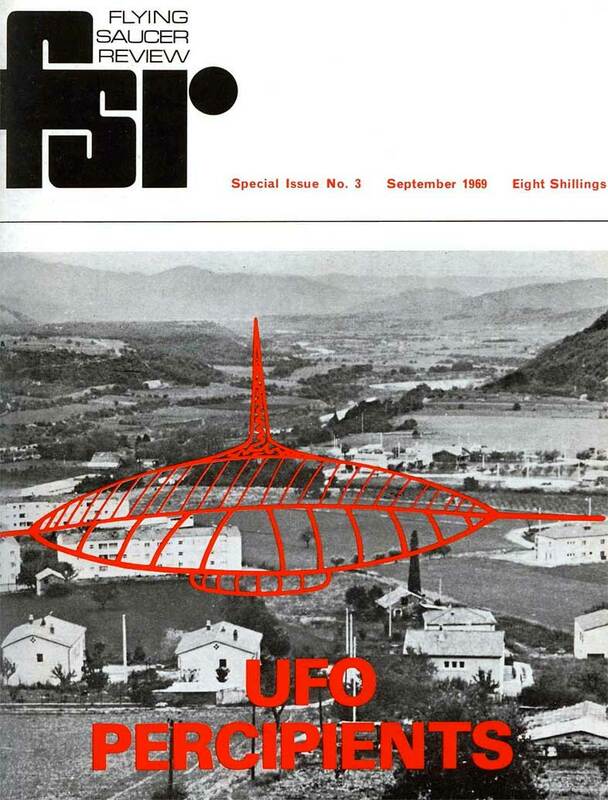 Dr X, my research assistants, and I myself all hope that the publication of this material will encourage students of Ufology to investigate similar cases that may already have occurred, and to send them to the Editor of Flying Saucer Review for publication. We think indeed that great progress could be made by the method of classification and comparison which yielded such valuable results in the beginning of the study of Natural History. The attentive reader will have observed that, by a good fortune which is exceptional in Ufology, Dr X’s account permits us to arrive at a pretty exact evaluation as to the size of the object and its movements. From the ridge of the roof of the first house on the left, to the right-hand extremity of the house with the three small windows, measures 64 metres. The length of the object, exclusive of the horizontal antennae, was thus about 65 metres. Its thickness, exclusive of the vertical antenna, is estimated by the witness at one-quarter of its length, i.e. about 16 metres. The spotlight can be measured on the ground on the landmarks given in photograph No. 7: its diameter equals 17 metres. The lengths of the antennae, vertical as well as horizontal, were, in the opinion of the witness, perceptibly about equal to the thickness of the object. Before taking these measurements and making these calculations, I had asked Dr X to estimate at arm’s length, with a marked ruler, the length of the object when it stopped (position in photograph No. 7). He did as I suggested, and showed me, on the ruler, 152 millimetres. I then measured the distance from his eye to the ruler while he looked, and it was 670 millimetres. It is a pretty good approximation, but which nevertheless shows either that the apparent diameter has been underestimated, or that the witness’s description contains a slight discrepancy. It is interesting to make the same calculation for all the positions of the object, the latter’s distance being directly known. These are the positions where it has been able to localise the spotlight on the map, i.e. the positions of photographs 3, 4, 5, and 6. Here still we end up with an underestimate. Between the estimated diameter and the anticipated diameter, the relationship was 1·21 for photograph No. 7. It is 1·47 for photograph No. 3.
we find that the underestimation of the apparent dimensions is constant and perceptibly identical since the start of the phenomenon. These calculations thus show a systematic underestimation between 1·50 and 1·21, the constancy of which is quite remarkable. To grasp the experimental implication of this, let the reader look successively at the same book at distances of 12 metres 10, 12 metres 70, 12 metres 60, 14 metres 70 and 15 metres, and let him estimate the apparent diameter each time. He will find that the variation is imperceptible. This absence of variation shows the coherence of the account insofar as the alleged movements are concerned. As we have said, Dr X is a very gifted musician. I wanted to know whether we could trust his sense of duration (tempo) in order to establish the detailed chronology of the phenomenon and thereby determine by calculations the speeds of the object’s evolutions, as we know precisely the distances covered from photograph 3 to photograph 7. With this aim, I made time-recordings of various mental experiments, the real duration of which could be known. For example, Dr X being seated in an armchair and not forewarned, I asked him to close his eyes and to imagine the time that had elapsed between the first call from his son up to the moment when, for the first time, he saw the objects from the terrace. Result: 4 minutes 9 seconds, clocked by me with a stopwatch showing tenths of a second. Then I invited him to do the same experiment again, but this time in reality, performing all the movements and taking all the steps. Result: 4 minutes 17 seconds, or an error of 8 seconds on 257 seconds, i.e. of 3 per cent. We do not know directly the position of the objects in photographs 1 and 2 (but it can be estimated, as will be seen below). On the other hand, we do know it for photographs 3, 4, 5, 6, and 7. On the map, the measurements give the following results (distance covered and mean speed) as in Table I. From this table the distances and the speeds corresponding to the first images (Nos. 1 and 2) are lacking. But the witness estimates at 16 millimetres the apparent diameter of the images on photograph 2 and at 11 millimetres that of the left-hand object on photograph 1. If, in conformity with what has been observed about his estimates in photographs 3, 4, 5, 6, and 7, we assume a coefficient of underestimation of 1·3, we must accept that the real distances were respectively 2,000 metres in photograph 2 and 2,140 metres in photograph 1, with possible errors that it is wise to accept as fairly wide. 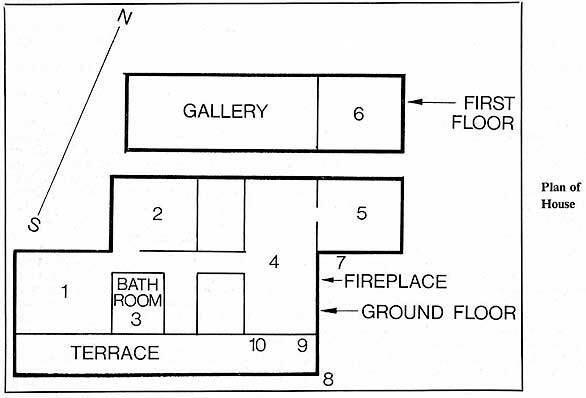 In these circumstances, the map gives a further table (Table 2). The overall picture of these results is shown in the table of the speeds between the seven successive positions. Another diagram needs to be set beside this table. This is the diagram of the actual movements of the two objects over the terrain. 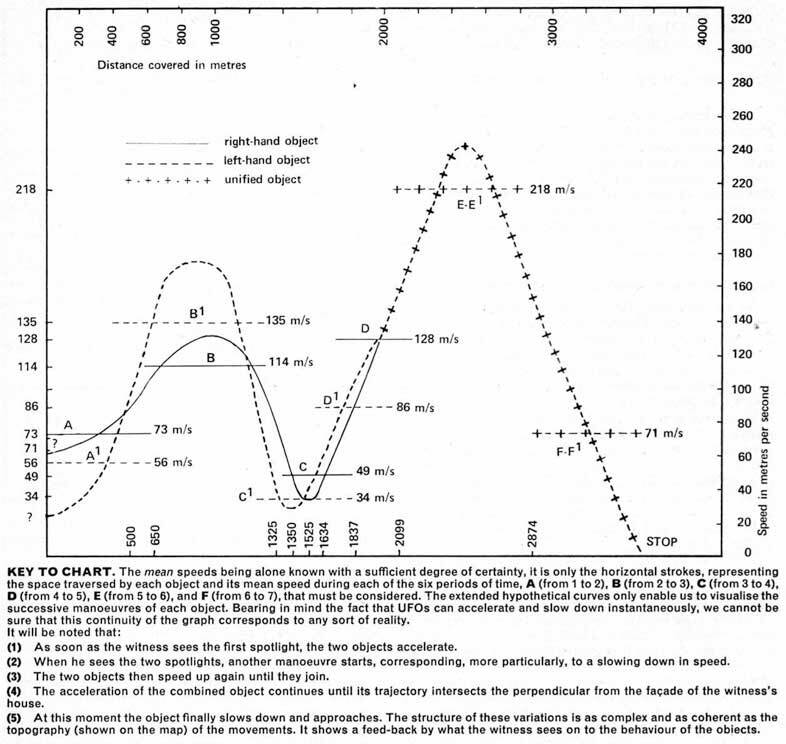 Comparison of the table of speeds with the diagram of the actual movements enables us to probe the meaning of a manoeuvre that is incomprehensible over the terrain. This meaning did not become apparent to the investigator (and from the investigator to the witness) until several months after the sighting when, the fine weather having returned, I was able to proceed, on the spot, to make all the necessary triangulations and measurements. Let us go back to the description given by the witness of the apparent movements and positions, and follow them on the diagram. In (1) the two objects are moving towards the left, 1 right being a little to the right of and behind 1 left. Let us remember that at this moment the witness appears on the terrace. Between (1) and (2), the two objects execute a primary manoeuvre which brings them into such a position that they are equidistant from the witness and that each of them alike is facing him with its lateral antennae. In (2) the left-hand spotlight becomes visible. We find that another manoeuvre starts at once: the two objects begin to move in a parallel fashion towards the left. But we now find in addition that in this parallel progress the left-hand object accelerates sharply, not only in order to follow the right-hand object which too is accelerating, but in such a way that the two objects are always equidistant from the witness. We note moreover that from this moment onwards and right up to the fusion at (5), the right-hand object traverses a rectilinear course (which is not discernible on the terrain and even less so from the witness’s terrace). Indiscernible too is the parallel movement of the two objects from (2) to (3). At (3) the two spotlights become visible to the witness. The left-hand object at once changes course and converges with the trajectory of the right-hand object. This change of course is not seen by the witness, who notices nothing. And yet the course taken at (3) will be held until the point of fusion at (5). At (4) the witness notes a pronounced drawing together of the two objects, as well as the manoeuvre of the spotlights which draw closer together until they combine. This manoeuvre is accompanied by an acceleration of the right-hand object which will remain constant until (6), beyond the point of unification. This too could not become apparent except in the calculations. The right-hand object, the trajectory of which was already serving as a reference for the movement of the two objects taken together, thus serves likewise as a reference for speed, since at (5) the two objects, fused into one, continue with the same acceleration as the right-hand object had done. At (5) the single object changes course, but still continues to accelerate as far as (6). At (6) the object cuts the perpendicular drawn from the facade of the house at the point where the witness is. At once a rapid deceleration is observed while at the same time there is a final change of course, the object now heading straight for the witness, slowing down as it does so. All these facts present a picture of highly complex mutual coherence, no element of which was detectable by the witness since the coherence only appeared through the calculations and despite the errors in estimation made by the witness himself. As a matter of fact these errors are of small account compared with the admirable self-awareness and precision with which Dr X noted all his impressions there and then and which should serve as a model to others. 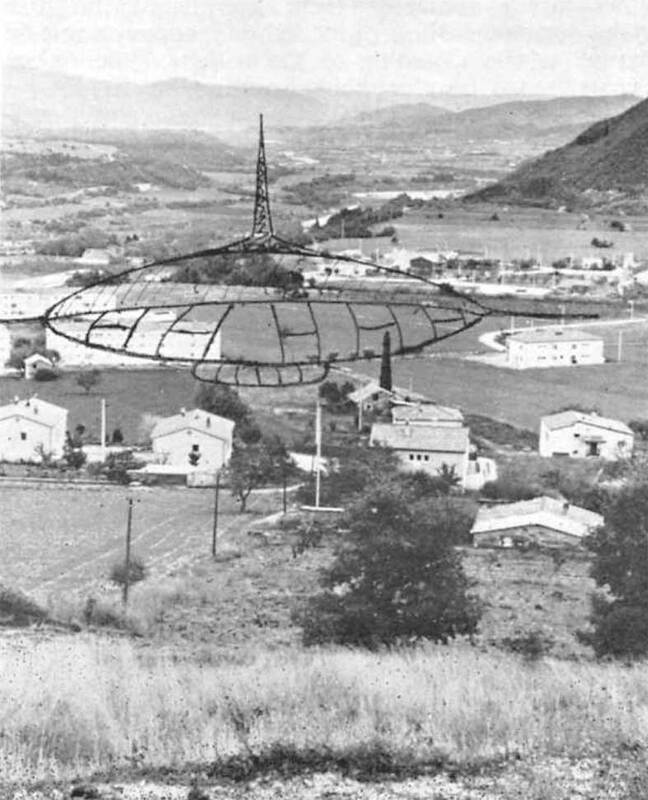 Twenty cases as well observed as this one would teach us more about the UFOs than the thousands of cases “studied” by “Commissions” and “Committees”. This coherence is disposed around a certain number of facts. (i) From (2) onwards, the two objects never stop facing him regardless of their marked angular movement. (ii) They maintain their equidistance from him. (iii) They accelerate until the moment when the combined object is precisely opposite his house. From that moment onwards, the object heads straight for him. (iv) Also very interesting is the behaviour of the objects as regards the view the witness has of the spotlights: as soon as he sees one spotlight, the right-hand object assumes a rectilinear course towards the point where the fusion will take place, while the left-hand object assumes a course parallel to that of the other; so soon as the witness sees the two spotlights, the manoeuvre of drawing closer begins which is to end 9 4 seconds later in the fusion. Unfortunately this analysis teaches us nothing about the behaviour of the two objects during the time that elapsed between the first cry of the child (and perhaps before that) and the appearance of the doctor on the terrace. Now, this time interval is long: we have seen that it is over four minutes. Whence comes the triangle on the child’s abdomen? Finally, we would mention that, at the moment when this report is being written (May 30, 1969) Dr X has, for six months past, been totally healed of the sequelae of his Algerian War wound. Since the night of November 1-November 2, 1968, no trace of any kind whatever remains of this wound, the effects of which had been felt, and without any change, from May 13, 1958, right up to November 2, 1968. “The incident occurred on December 9, 1968, at 3 o’clock in the morning. The object, which was emitting a light that fluctuated between dark red and violet, was at a distance of 2 or 3 kilometres from the witness.